Intuitive eating is a hot topic, and I often get asked about how drinking alcohol fits in. The holidays are upon us, and drinking ramps up as we deal with the onslaught of parties and family time. Every January, I hear the same diet chatter: you overdid it at the holidays and must now absolve yourself by participating in Dry January. If you find yourself wanting to engage in this yearly “cleansing” ritual, this post is for you. 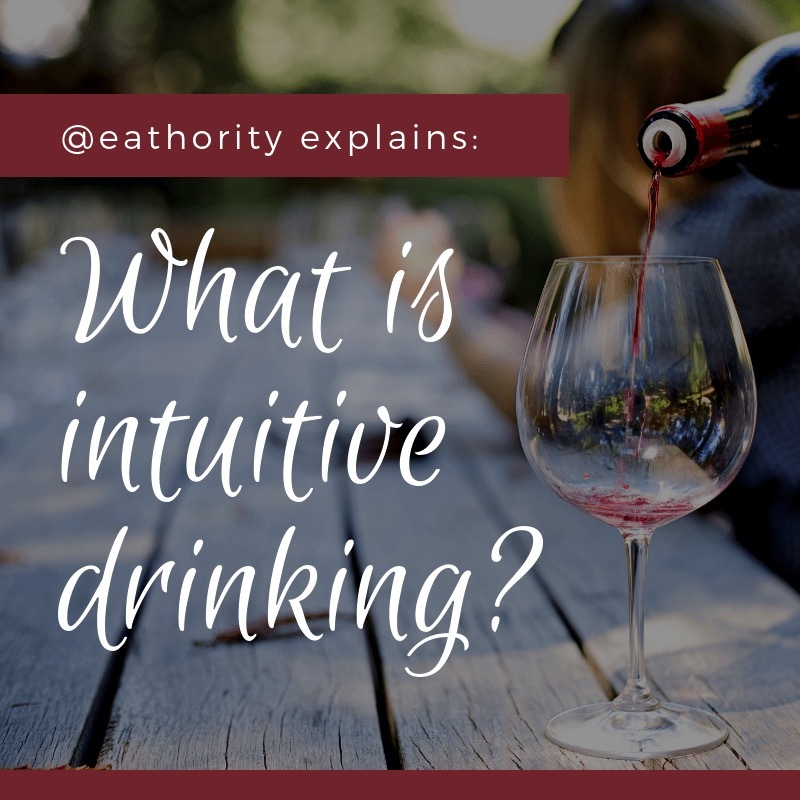 It will help you understand intuitive drinking, and how you can learn to imbibe in tune with your body and mind’s needs. Come January, you’ll be able to sip on that Pinot with your steak, all free of guilt. Let’s cheers to a restriction-free life! This is not what you want to be hearing four days before your Nebiollo-filled vacation. I had an H. pylori infection, and it is a nasty little bug. Well, shucks. After some negotiation, I came away with a win. I postponed the medication until after vacation and took it easy with the booze. But the day after I returned home, I began an intense antibiotic regimen to rid myself of an infection that has the potential to cause ulcers and gastric cancer. It’s not a regimen you want to be half-assing. Thus began two weeks of forced restriction. What happens when you’re used to giving yourself permission to eat and drink whatever you want, with attunement (most of the time), and now you can’t? It’s challenging and upsetting on multiple levels. As an anti-diet dietitian, I react negatively to restriction in general. Barring a medical issue, it’s not necessary to restrict your eating and drinking to be healthy. In fact, restrictive behaviors can have a harmful effect on physical and mental health. Research backs this, as does my clinical experience. As a person who has dabbled in restriction, my reaction is even more visceral. Being forced to restrict something I enjoy felt deeply unsettling. It brought me back to my Paleo days when I limited many foods, including booze because I had been taught to fear them. Part of me was also pissed off. My inner diet rebel, that rebellious teenage voice that hates being told what to do, made it clear she didn’t want her autonomy encroached. But sometimes teenagers have to do things they don’t like. I had to remind her the restriction was temporary and a form of self-care. She understood but sulked the entire two weeks. Grumpy teens are not fun to deal with and do not like missing out. The NYC weather was beautiful, and she and I had to sit through multiple outdoor meals where my friends imbibed freely. Why is abstaining so hard? Some of us get social anxiety. For me, it’s particularly evident when I meet new people or am rolling solo to an event. Alcohol can be the crutch that smooths out any awkwardness in first encounters or boredom at the table. Without it, you’re forced to confront and feel the discomfort that may accompany social situations. Why don’t people want to face the discomfort? There is often an underlying fear you may not be or sound interesting, which is fundamentally a fear about not being liked or being thought of as stupid. We interpret these as rejection (lean into that one for a second). Boredom is equally uncomfortable, and in an age where people feel pressure to always look like they’re having fun, the reality that you’ve run out of dinner conversation is a sure buzz kill. When this moment sets in, you truly know it’s time to go home. I love the moment you take that first sip of wine, but I find the best sip to be the third. You’ve gotten to know the wine, it’s still exciting, and your diaphragm has relaxed. You also get that buzz that accompanies a little bit of booze, and the problems of the world seem a little lighter. But it’s a slippery slope, and depending on your state of mind and the amount of food in your belly, it can be easy to slide into sloppyville. Alcohol can enhance the flavors in a meal, and result in that magical third flavor that happens when you eat a delicious bite and immediately follow it with a sip of wine. During these two weeks, restaurant dinners were still enjoyable, but it felt like something was missing. Eating out is fun and enjoyable. There’s no setup or cleanup to distract and frustrate you. As someone who works alone, eating out is a way to socialize and scratch the itch to connect with the people most important to me. I genuinely enjoy drinking, and pairing it with excellent food and company elevates the experience on so many levels. Not drinking makes your sleepiness extremely pronounced. Without a steady stream of energy coming in from alcohol, by the time 9 pm rolls around, the entirety of your day’s efforts dawn on you and your body itches for PJs and cotton sheets. The question of dependence certainly comes up. Am I dependent on this substance if I have such a difficult time abstaining? Admittedly, there is a physical craving that goes unfulfilled when you want to drink but can’t. But it passes, and you realize the withdrawal is more emotional (for all of the above reasons). While the experience was less than ideal, there were some upsides to my forced abstention. I slept really well. I was super hydrated. It was easier to tune into my fullness during nights out. It widened my empathy lens for people with intolerances because not partaking in a food ritual can feel a little isolating. But even with these positives, I would not elect to abstain from drinking permanently or for long stretches of time. I don’t judge people who choose not to drink, but for me, the connection to people and food is far too important. So, what is intuitive drinking? Do I actually want a drink right now? Many of us default to alcohol at dinner, but take a moment to really think about what you want. Is it the expectation or habit that is driving you towards that drink or do you physically want it? If the answer is you really want it, then go for it. If you sense a tinge of indifference (that “meh” voice), then skip it and see how dinner unfolds without your usual libation. What is my mindset going into drinking? What am I using drinking for? Just like with food, some people use alcohol as an emotional crutch. Perhaps you had a stressful workday or are experiencing family difficulties. Drinking takes the edge off and might even be a way to avoid uncomfortable feelings. If you notice you have this tendency and are interested in some self-exploration, what are there other ways to deal with those emotions that do not involve alcohol? It could be talking with a friend, crying, hitting a pillow or venting to your therapist. Get curious about your drinking intentions and be open to exploring other coping mechanisms. It’ll take some trial and error to figure out how many drinks and what types won’t negatively impact your sleep or leave you dragging the next day. Keep in mind your tolerance can change depending on your age, what you’ve eaten and how hydrated you are. Over time, you’ll get a sense of what is a manageable amount for your body. Does this still taste good? Sensory-specific satiety is the decline in satisfaction that occurs during food and beverage consumption. As you’re drinking, check in with yourself on occasion and ask yourself if the drink still tastes good. When you notice it’s lost its appeal, consider putting it down or slowing your sips. Parallel process this question alongside your exploration of tolerance levels. How will I feel physically tomorrow? If it’s a Wednesday night and you have an important work meeting, keeping it to one or no drinks might be your best bet for feeling sharp. Use past experience to gently inform your decision. If I drink for a few days in a row, how does it feel to be in my body? Observe how you are feeling physically and emotionally if you engage in consecutive nights of drinking. Take note of what it feels like to be in your body on those days versus days when you are not drinking. Do you feel a little down or maybe you’re dragging more than usual? If I choose not to drink, is the intention behind this self-care or restriction? Using the previous example of a work meeting, turning down a weekday drink can be a matter of self-care. Choosing to consume little to no alcohol because you are genuinely concerned about cancer risk is also valid (see the last bullet point). But if you are avoiding or limiting alcohol because of body image concerns, and your underlying desire is to drink, you may be setting yourself up to overdrink or binge when the occasion arises. The more you deprive yourself of something you enjoy, the more likely you are to overdo it and feel guilty about it. I made the decision to stop drinking after ___ drinks because any more will make me feel awful the next day, but now I feel sad. Just like with respecting fullness, there may be a little sadness that accompanies stopping when you’ve reached your tolerance threshold. It’s very normal. Take comfort in the fact you are doing something to care for your body and focus on the moment in front of you. You can still enjoy yourself even without more drinks. Or maybe your sleepiness will make itself known and you’ll have to call it an early night! I drank too much and feel bad. If you find you’ve had too much to drink, try not to beat yourself up. React neutrally and compassionately, and use it as a learning experience. I find this phrase to be helpful: “That was more than I would have liked to consume, but now I know ___ amount of drinks is too much and next time I will try my best to be more mindful.” Take note of how your body feels in that moment and ask what it needs to feel better and cared for. How can I use a gentle nutrition approach with alcohol guidelines/facts? I intentionally chose to make this the last question. As the last principle of intuitive eating, gentle nutrition is introduced in the later stages because it can interrupt the process of getting in touch with your body and making peace with foods. Similar thinking applies here. If you’ve had a contentious relationship with alcohol from a calorie and body image perspective, learn to make peace with it first so that having a drink is as emotionally equivalent to having an apple. Once you feel more neutral about alcohol, use the health guidelines below to gently inform how often you consume it. Note: beverages within the same category have different alcohol content. A beer with 8% alcohol will affect you very differently than one with 3.5%. Adjust your consumption accordingly. Binge drinking is defined as 4 or more drinks for women, and 5 or more drinks for men, usually occurring within two hours. Drinking alcohol is associated with an increased risk of several cancers, including breast, colorectal, head and neck, esophageal and liver cancers. Even light consumption is associated with increased risk for esophageal and breast cancers. Keep in mind, these studies show correlation, not causation. This information is not meant to scare you away from alcohol, but it would be a disservice not to mention this data. The Dietary Guidelines for Americans do not recommend that people who do not drink alcohol start drinking. 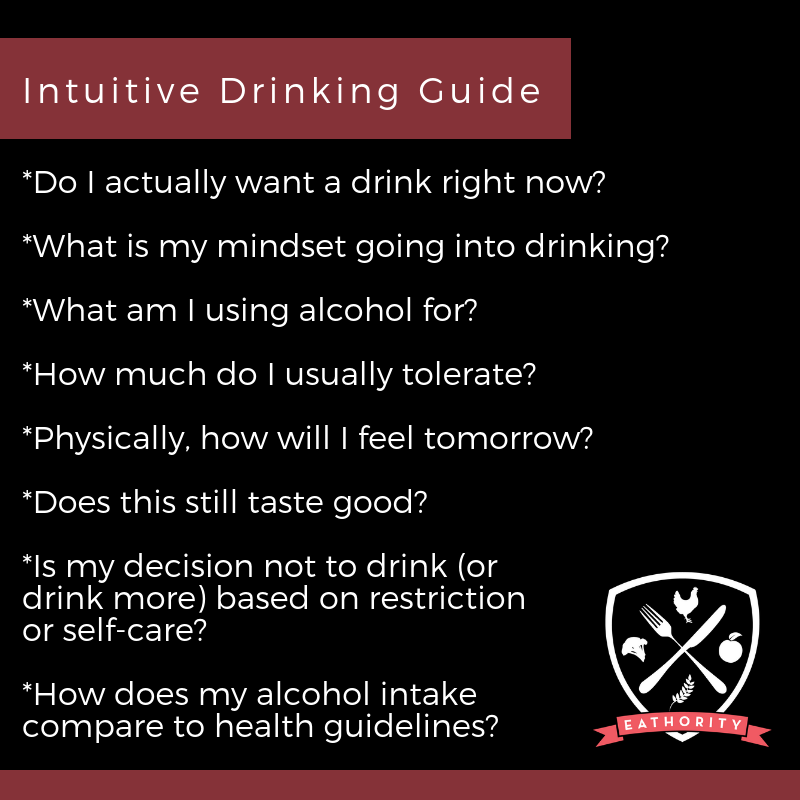 Becoming an intuitive drinker is a process and there is no right way of doing it (sound familiar?). Once you have read through the questions and suggestions I’ve outlined above, begin with the ones that seem most relevant to you. Every week or so, assess where you are and what next questions you want to explore. Maybe you want to start with figuring out your tolerance levels and then examine your intentions behind drinking. Or maybe you want to start with intentions and then toy with tolerance. Over time, you will be able to integrate all these suggestions in a way that feels natural and caring. If you have gone through this experiment and find you are using or avoiding alcohol in ways that feel destructive or restrictive, talk to a trusted doctor, therapist or non-diet dietitian about this. They can help guide your next steps. What does it mean that I’m a dietitian who loves to drink? Honestly, there’s not much meaning behind it except that I genuinely enjoy the taste and how it enhances the meal experience. For the most part, it’s not something that happens daily, and when it does, it’s usually temporary during events like a vacation. And, that’s okay. I don’t encourage anyone to start drinking if they do not drink, but I do encourage people who do drink to examine their relationship with alcohol and how it affects their mind and body. Consider the general health guidelines and make informed decisions that feel right for you. Hopefully this article provides some clarity on intuitive drinking. If you need help improving your relationship with food, alcohol and your body, feel free to reach out to me. And pin the image below so you can always have a quick reminder of the intuitive drinking tips I’ve outlined in this article. Discover tasty restaurant eats, non-diet nutrition tips, and receive a FREE guide to figuring out your next meal. Check Spam or Promotions for your welcome email.